Day on the Hill attendees gather in front of the Capitol Hill Club, the setting for Wednesday morning's breakfast. CDA distributor members braved the stormy skies of Washington, D.C. this week for CDA's Day on the Hill. “Building relationships with legislators is key, and Day on the Hill enables members to speak directly to their congressmen and senators on the key issues facing the convenience distribution industry today,“ explained Kimberly Bolin, CDA president and CEO. 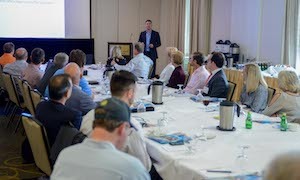 The program began on Tuesday with an engaging and enlightening presentation from the Congressional Management Foundation’s (CMF) Seth Turner. Turner shared tips and tools on effective lobbying and building relationships with lawmakers. According to CMF’s research, 95% of legislators rank commitment to their constituents as the top priority of their job, making personal advocacy the most effective strategy for impacting legislation. Turner ended his session with an advocacy role-playing exercise with attendees, helping to prepare distributors to more effectively communicate issues to their legislators. After a welcome from CDA President and CEO Kimberly Bolin, CDA’s senior policy advisor, Shannon Campagna, provided attendees with an issue briefing, highlighting the core asks of the association. The four issues presented to legislators this week included: support of the Supplemental Nutrition Assistance Program (SNAP) in its current form and an appeal to lawmakers to vote no against any effort to limit SNAP choice during consideration of the 2018 Farm Bill; support of S. 261, a bill that relieves some of the onerous restrictions of menu labeling found within the Affordable Care Act; support of H.R. 1136, the Cole-Bishop Bill, which would change the predicate date for ‘newly’ deemed tobacco products, among other changes; and support of the H.R. 5358, The DRIVE Safe Act, a bill that would enable 18-years-olds to obtain commercial driver’s licenses through a structured, graduated license program. 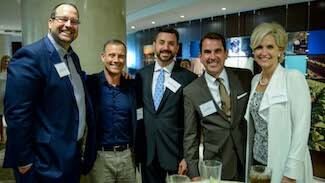 Tuesday was capped off with a reception and dinner, hosted by Altria Group Distribution Co., at the company’s Washington offices, where attendees were treated to a brief address by Rep. Darin LaHood from Illinois’ 18th Congressional District, followed by an address from Rep. Sanford Bishop from Georgia's 2nd Congressional District. Bishop is the co-author of the Cole-Biship Bill and spoke to the need for CDA members to support the bill. 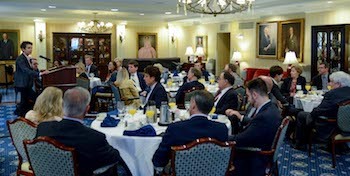 RAI Trade Marketing Services Co. hosted attendees for breakfast on Wednesday at the Capitol Hill Club where the group heard from Amy Walter, national editor of The Cook Political Report, on the current state of affairs in national U.S. politics. In a lively discussion, Walter examined the high level of polarization among the nation's electorate today, and provided some insights into the coming midterm elections. Members fanned out across Capitol Hill for meetings that stretched to the late afternoon. "Once again, CDA members impress us with their dedication and willingness to come together to protect and promote this industry," Bolin noted. "They take time out of their already time-strapped schedules to be here in Washington, D.C. to have their voices heard. CDA events continue to operate full steam ahead because of these hard-working, intelligent, energetic individuals." "The most important aspect of this event is that it lets the different politicians within our states and districts understand what's important to our businesses," said CDA Chair Kevin Barney, Atlantic Dominion Distributors, Va. Beach, VA. "As distributors, we need to come here and represent the states that we operate in." "It's really great to get face time with our congressman and senators, and it's important that we come to Washington and voice our opinions," said Taylor Douglas, Douglas Cos., Conway, AR. "It's also a great networking opportunity, not only to meet with our representatives, but to discuss ideas and issues with industry colleagues." 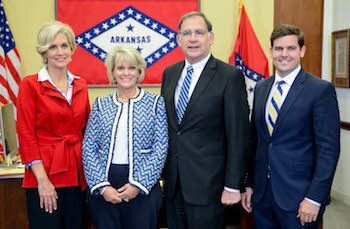 To the right (l-r) is CDA President & CEO Kimberly Bolin; Susie Douglas Munson, Douglas Cos.; Sen. John Boozman (R-AR); and Taylor Douglas, Douglas Cos.
At the Tuesday night Day on the Hill reception are (l-r) Blake Benefiel, Altria Group Distribution Co.; Jeff Allen, Allen Brothers Wholesale Distributors; Alex Baloga, Pennsylvania Food Merchants Association; Jim Pulsifer, Altria; and CDA President & CEO Kimberly Bolin. 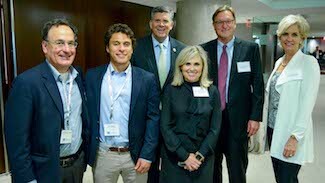 Posing (l-r) are Chris Atayan and Ara Atayan, AMCON Distributing Co.; Rep. Darin LaHood (R-IL); Shannon Campagna, CDA; Ted Stessman, Farner-Bocken Co., A Division of Core-Mark; and Kimberly Bolin, CDA. Rob Sincavich, Team Sledd, meets with Sen. Shelly Moore Capito (R-WV) during Wednesday's meetings. 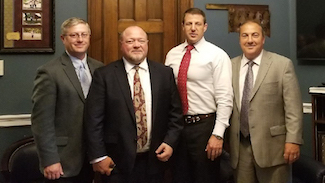 CDA members from Oklahoma meet with Rep. Markwayne Mullin (R-OK). Pictured (l-r) are Corey Cooper, Stephenson Wholesale Co.; Matt Robinson, Standard Distributing Co.; Rep. Mullin; and Jimmy Naifeh, Standard Distributing Co.